Sometimes the energy of the load may have to be fed to the supply system. A Chopper in this mode is called regenerative. The chopper working as a switch is connected across the load, which is normally a dc machine and the diode is connected in the line. The dc machine works as a generator during this mode. 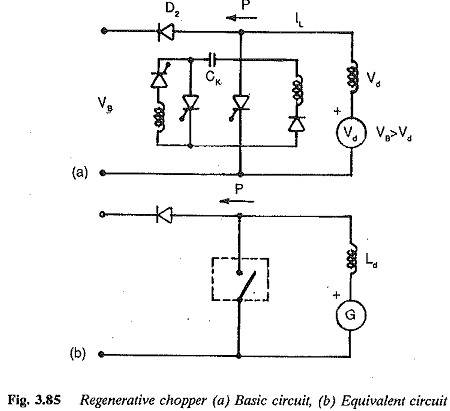 Thus a Regenerative Braking is obtained by changing the positions of the diode and thyristor switch of a normal chopper, as shown in Fig. 3.85. As long as the thyristor is ON, the generator and Ld are short circuited, the current in the load increases and energy is stored in the inductance. When the chopper is switched off a large voltage occurs across the load terminals. This voltage is greater than Vd and the energy stored in the inductance is fed to the supply system. When the voltage of the load falls to Vd, the diode in the line blocks the current flow, preventing any short circuit of the supply when the thyristor is switched on. Thus the complete energy of the load can be supplied to the source. Very effective braking of the motor is possible up to extremely small speeds. Regenerative braking is achieved here by chang­ing the direction of current flow. A remote control may be arranged by a suitable logic to switch the normal chopper to a regenerative chopper and vice versa. A small delay is required, for transition from one mode to the other.